Before I get into other issues, I just want to remind residents of Richmond and beyond that the City is hosting a public meeting on a development application for 6335 Perth Street, which is the land between the Fire Hall and the Home Hardware. This plan calls for 1000 homes phased in with between 50-100 units being built each year. The meeting is to be held on February 13 at the Richmond Arena at 7:00pm. The Official Plan Review for the City of Ottawa is officially underway. The City’s Official Plan is reviewed every five years. This is a year long process which results in an updated Official Plan that comes into effect in 2014. As the Chair of the Rural Review Steering Committee, I am one of five Councillors on the Official Plan Sponsors Group and I look forward to being heavily involved in crafting this updated document. Residents are encouraged go online to have their say on how their city grows in the future. The City of Ottawa is reaching out to the public on how neighbourhoods, roads, water and sewer services, rural villages and cycling and walking pathways should be planned. Building a Liveable Ottawa 2031 – a city-wide review of land use, transportation and infrastructure policies that feed into the City’s Official Plan, Transportation Plan, Infrastructure Master Plan and the Cycling and Pedestrian Plans – was launched on January 29. The focus of the project and public engagement goes beyond a visioning exercise. 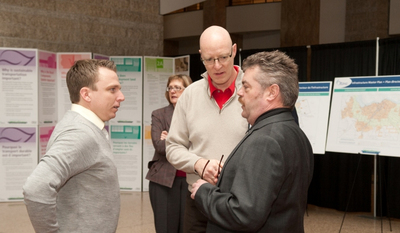 It deals directly with proposed solutions to 12 current planning issues, which are profiled on ottawa.ca/liveableottawa. The site also features a summary of each issue and each proposal, a video, and feedback mechanisms, including a survey that is available until March 1. Residents are urged to review the information before providing their survey responses. The rural component to this review specifically speaks to no expansion of village boundaries but also at where to direct rural growth. Richmond, Manotick and Greely are projected to see the majority of the growth in the coming years. However, with the current development applications in Manotick and Richmond, the projections match the planning targets so this will not create new pressure on either village. Last week, I had the pleasure of attending the send-off for Manotick’s very own rink of Jamie Sinclair, Holly Donaldson, Katelyn Wasylkiw and Erin Jenkins to the 2013 M&M Meat Shops Junior Curling Championship in Fort McMurray, Alberta. Along with their coach, Graham Sinclair, it was a great night to celebrate their achievements at the Manotick Curling Club and wish them luck as they headed out to Alberta. The Championships are currently underway and at the time of printing this, Team Sinclair is 3-0. The finals are this weekend and their progress can be followed at www.curling.ca. Good luck girls! Port and Chocolate has always been a favourite pairing and what better way to accentuate our winter season than with a night dedicated to this attractive relationship. On Friday February 8 at 7:30 p.m., Watson’s Mill is excited to host a romantic evening that will expose the tempestuous flavour of our closest comfort food with the best full bodied wine. Leading guests into this passionate night of selected tapas, sweets and port will be Lori Savignac, Chocolate Lover Extraordinaire, who will deliver classic romantic readings, explain pairings and perhaps give a little chocolate trivia. Manotick’s French Café will be providing the desserts and tapas. All proceeds go to the ongoing operation of Watson’s Mill. Tickets for this event are $35.00 (must be legal drinking age) and can be purchased at the Watson’s Mill Office, French Café, or Manotick Office Pro. There are a limited number of tickets, so call today to reserve: 613-692-6455. Join the Goulbourn Museum for all things maple at their P.A. Day program February 15. Wear your most Canadian outfit, make some maple treats and learn the art of maple syrup. There will be games and activities aplenty. The fun takes place on Friday, February 15 from 1-4:30 p.m. and is geared to children ages 7-11 years. Cost is $25 per child. Snacks will be provided. To register please call the Goulbourn Museum at: 613-831-2393 or email: education@goulbournmuseum.ca. The Goulbourn Museum is located at 2064 Huntley Road, just south of Stittsville, at Stanley’s Corners. For more information, please visit http://goulbournmuseum.ca/whats-happening/, call 613-831-2393 or visit us on Facebook. Ottawa’s only GOLD-rated Soccer Club by the Ontario Soccer Association is beginning registration for all Summer Programs on February 6, 2013. Celebrating its 10th Anniversary of Soccer Excellence, OSU is proud to offer programs for all ages and abilities. Programs fill up quickly, so don’t be disappointed – check out our website at www.osu.ca for a list of programs and registration information. Many residents around Manotick may have recently noticed that Minto has begun preliminary work on Phase 1 of their Mahogany development. One of the commitments made by Minto to the residents of Manotick was to not use Manotick Main Street during construction. Although this commitment was made well before I was elected, I was familiar with it and I expected it was worked out with City officials. Last week, unfortunately, I realized it was not and trucks were carrying on down Main Street with no real alternative as First Line Road is not a truck route.